The live performance remains the best way to have a repertoire well known among the audience, especially when we speak about the intimate and convivial experience of chamber music. However, it is essential to preserve this heritage through the recordings. 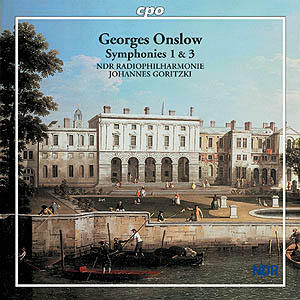 Therefore, the musicians who devoted themselve to the work of George Onslow are rare enough so that we pay them a tribute. The very first initiative, and by far the most important until today, is due to Carl de Nys at the Valprivas cultural center (France) : the result was ten records produced between 1972 and 1992 from which only one was released as a CD. 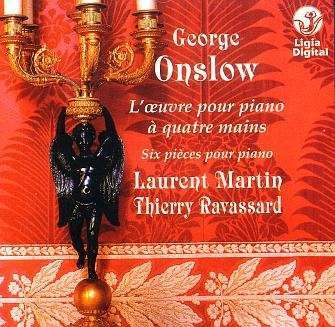 This beautiful collection allowed the music lovers to discover for the first time a number of Onslow's scores : both Great sonatas for four handed piano (op.7 et 22), Quintet op.76, Sextet op.30, Septet op.79, Nonet op.77, two trios (op.20 et 83), the three cello sonatas op.16, string quartets op.8/1, 9/1 and 66, string quintets op.43 and 78, and various pieces for piano. 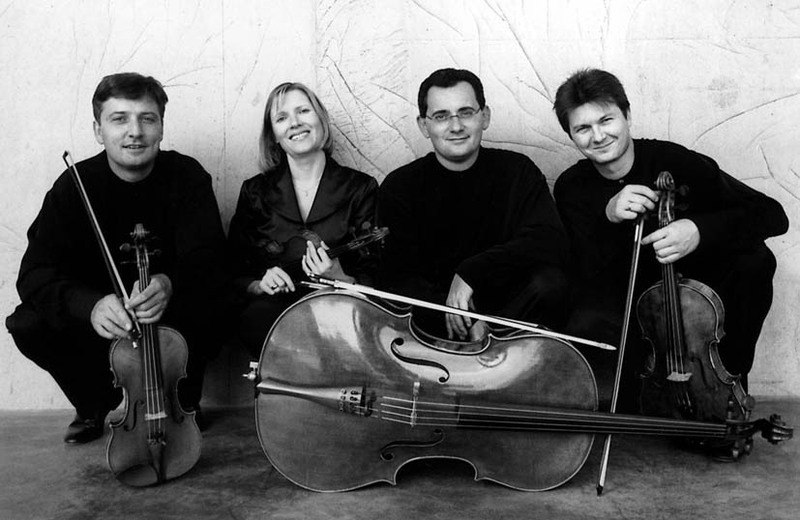 Talented artists such as the Parrenin quartet, the Bern quartet, the Chiligirian quartet, the Consortium Classicum, the violonists Gérard Jarry and Yvon Caracilly, the violists Serge Collot and Rainer Moog, the cellists Michel Tournus and Maurice Gendron, the bassists Jean-Pierre Logerot and Daniel Grimonprez, the pianists Hélène Salomé, Monique Mercier, Laurent Martin and Werner Genuit, took part to this excellent series : the original tapes still wait a rerelease worthy of its quality and historical importance. The only Carl de Nys' recording available as a CD : a reference. 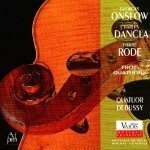 Nowadays, the Mandelring quartet started recording a selection of the 36 Onslow's quartets : the first three CD released by CPO are already known for their great artistic value : we have interviewed Sebastian Schmidt, first violin of this talented ensemble, about his experience as an Onslow's interpreter. 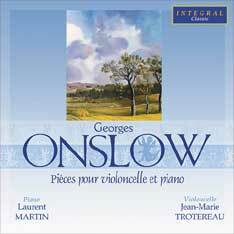 The George Onslow website : When and how did you discover the repertoire of Onslow ? 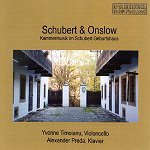 Sebastian Schmidt : As is stated in the booklet of the first of our CDs (I believe) it was actually our father who as a student of musicology started to be intereszted in George Onslow and collected all the chambermusic he could find. So in the end he had almost all the sheet music collected ant this was waiting for us to be discovered in our living room. He did not continue working on the material but is now very happy to see his children continue in a slightly different field: as performing artists. 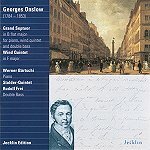 The G. O. w. : Did the project of a complete recording of his 36 quartets appeared early ? found nine quartets so far we wanted to present on CD. Will there be more? We don't know yet. The G. O. w. : How do you select the works you record ? S. S. : We read many and then decide democratically for the best ones. It is all a matter of taste. Once we had a suggestion for one of the quartets by an amateur musician who liked this piece especially. We agreed and chose it for our third CD. The G. O. w. : How would you define the style of Onslow, both aestheticaly and technicaly ? 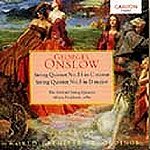 S. S. : I believe that if Haydn had lived longer and then developed his way of composing, he would possibly have written music similar to Onslow's (or vice versa). 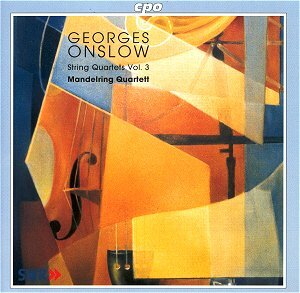 Onslow we find very interesting especially in his earlier works, he has quite a unique way of melodic development, fast technically tricky outer movements, beautiful slow and short an very often ver characteristic scherzo movements. In is sonataform very often his second themes are totally contrary to the first ones (which makes it difficult to find a good tempo). In his later works, when romantic music developed, he did not follow the ney style of writing but found his own way. 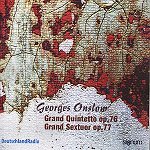 We believe, that someone who has once seen or heard Onslow's music will have no difficulty in recognizing his music lateron. The G. O. w. : When shall your next CD be released ? 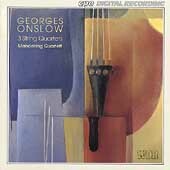 S. S. : Our next CD will be a CD containing a string quintet with double bass and the fabulous nonet. We will be collaborating with double bass player Wolfgang Güttler and the wind players of the Ma'alot Quintet. It will be recorded in the middle of December 2003 and probably released next year. The G. O. w. : We wish you as much success as with your first recordings. Thank you very much Sebastian Schmidt for your kind participation. Now, we invite our readers to view our selection of CD. 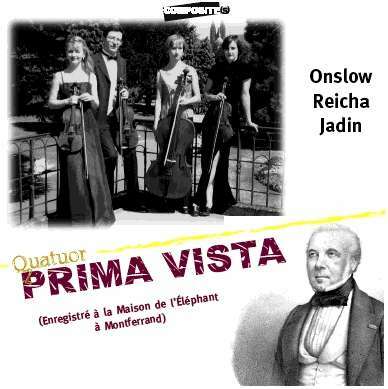 Some ensembles intentionally devote themselves to the onslowian repertoire (Mandelring quartet, Prima Vista quartet), while others perform it more punctualy as does the Debussy quartet, one of the most brilliant French chamber group of its generation. Christophe Collette, its first violin, kindly accepted to answer our questions concerning his recording of the Onslow's opus 48. 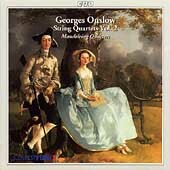 The George Onslow website : How did you happen to know George Onslow ? Christophe Collette : We were commissioned by Auvidis-Valois to record a 19th century French quartets programme. After some researches, we choose Onslow, Rode and Dancla. This work was done in collaboration with the A.F.P.M. (French association for music patrimony), and with the support of the music foundation of the Société Générale. The G. O. w. : Why did you decide to record the Quartet opus 48 ? C. C. : Among all the quartets we have sightread, those of the opus 46 to 48 seemed to us more elaborate, well made and very original. We had to make a decision : the scherzo of the 23rd quartet seduced us and forced our decision. The G. O. w. : Have you perform this score live in concert and if so, how did the audience react to it ? 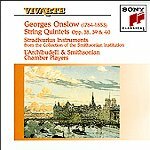 C. C. : We performed this quartet many times, especially in Germany, but also in Clermont-Ferrand (the birth town of Onslow) in a festival managed by the Onslow Quintet. (N.D.L.R. : this festival does not exist any more). Each time, the reception was excellent : the audience was glad to hear for the first time two unknown and appealing works. The G. O. w. : How would you define the Onslow's style ? C. C. : It is virtuoso, with a trend for audacious harmonic inventions, a genuine rhythmic vitality, without loosing the melodic seduction of the French quartets from this period. 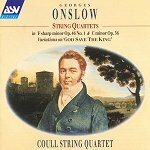 The G. O. w. : Do you plan to add some other Onslow's quartet to your repertoire ? The G. O. w. : We hope it keenly. Thank you Christophe Collette. 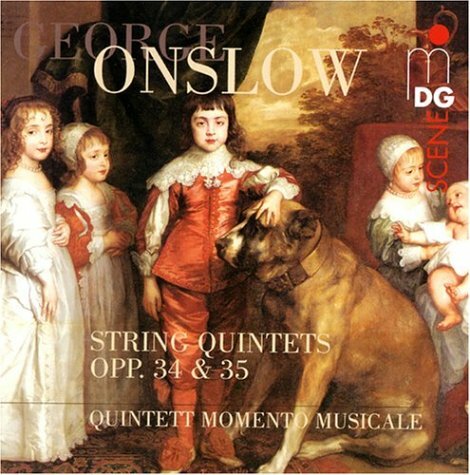 This discography, which includes the majority of the CD devoted entirely or in part to the work of george Onslow, unfortunately is still very limited : some of these recordings have become quickly unavailable due to their short printing and them not being rereleased. 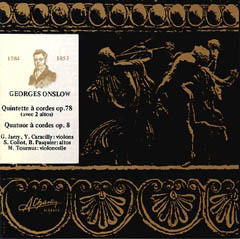 One could note also that some scores are over-represented (particularly both Duos opus 7 and 22), whereas thequartets and quintets are still unrecorded for the majority of them : this is all the more surprising that the pianistic work of Onslow is minor in comparison with his string chamber music catalogue which, in his time, gained him an european fame and remains today the main reason why one should pay tribute to him as an important composer. We will update this page in order to keep our readers informed about the new recordings to be released, the most important being the fourth Mandelring's CD and the 1st and 3rd Symphonies by the Hanover Radio Philharmonic Orchestra. Variations on the "God Save the King"